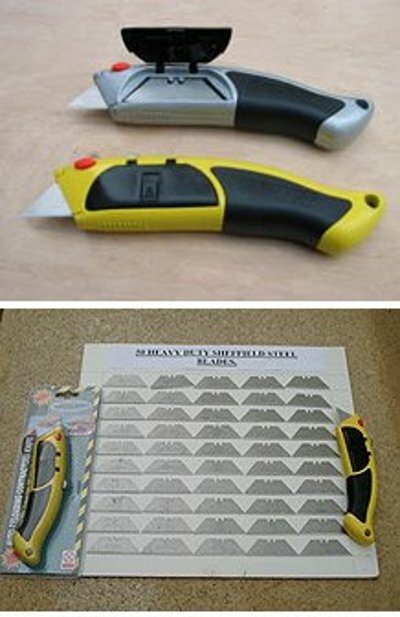 Cool DIY or Craft knife which slides fresh blades from its handle on your command. Supplied with 100 cutting blade edges. In the side of this metal contractors knife is a hatch. In the hatch you can fit 10 double edged blades. Need a fresh new super sharp blade? You press a button and slide a lever. Old blade is released. New blade takes its place. The old blade is double edged with two cutting edges, so you reverse it, and return it to the hatch so the fresh cutting edge comes out in future use. When all 20 cutting edges are used, you have 80 cutting edges to go. And so the cycle of blade life continues for 100 cutting edge lifetimes. This is a DIY Craft knife which gives and gives and gives over many years of projects. As you can see, the design is also ergonomic with grips and specially angled handle to direct pressure to the tip for easy cutting. So a knife which loads new blades from its handle on command and comes with 100 cutters. Just what you need on your next project and many more to come. You might never buy another DIY or craft knife. Ratchet Screwdriver And Socket Set Tool Box. Knife With Blades text, images and video are copyright.